The Communifire REST API provides access to Communifire data and features. Expand functionality, customize your experience, and integrate Communifire with other platforms using the Communifire REST API. The possibilities with the Communifire REST API are endless. To start using the REST API, first make sure that the admin has enabled REST API access in Communifire. Once the REST API is enabled, you need to get your REST API access key. The Users REST API includes methods to get user data, create and manage users, and create and manage user roles. You can also search for users, manage user membership, update user points, and more. Example: If you want to use data from an existing platform or database in your community, the Users REST API is exactly what you need. 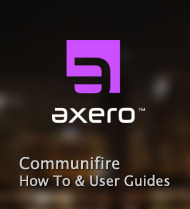 Mass import user data and create new Communifire users using Add User. Use Update Address when employees move to new locales. Use Update Role as employees change titles. The Content REST API includes methods to get content and content lists, create content, and manage content. You can also get queued workflow content, manage content categories, manage files, and more. Example: Display content on your company lobby's TV screens with the Content REST API. Display photos with Get Content List. Display upcoming events with Get Events. Display client feedback with Get Space Wall Posts. The Space REST API includes methods to get spaces and space data, create spaces, and manage spaces. You can also manage space membership, manage space roles, and more. Example: Need to create a company organizational chart? Get department names with Get Space, employees' titles with Get User's Space Roles, and employee title descriptions with Get Space Role. The Chat REST API includes methods to send messages, get messages, update chat threads, and more. Example: Want to move a conversation from email to chat? Start a new Communifire chat thread and include all participants. The Comments REST API includes methods to create comments, get individual comments, and get comment lists. You can also edit comments, delete comments, and set comment statuses. Example: Want to submit a certain idea to management? Compile others' thoughts on the idea using Get Comment List. The Permissions REST API includes a method to check the permissions a user has for content.